Will the OC Housewives Keep Me From Becoming a Tigress?? It’s Friday night at 10 O’clock. Do you know where your housewives are? All right, the secret is out (I don’t really think it was a secret in the first place.) 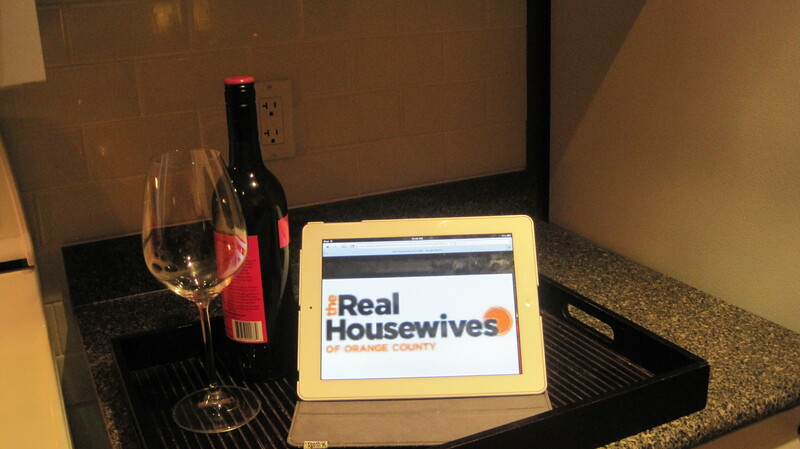 My guilty pleasure is watching the Orange County Housewives. This wouldn’t be so bad but I like to watch the bevy of blonde drama while drinking wine. There. I blogged it! I am not sure what it is about the show that makes me crave wine. Maybe it’s the fact that I feel guilty for indulging in such useless rubbish while there are important issues going on in the world, that I subconsciously drink myself into a state of oblivion. No that’s not it. Maybe the OC ladies have become my Friday night routine. I do tend to be a t-Rex of habit you know. It could be that Gretch, Tamra, Vicky, the new chick and Alexis always seem to have cocktail in hand, thus only tempting ME to drink along with them. I do tend to be a weak little t-Rex you know. Heck I don’t really know what it is! But before someone is getting a nose job or breast reduction, or the clicking of Prada heels are heard walking into some posh restaurant to meet “the girls” or good ole Vicky lets out her first Woooo-hoooo, I’m already half way through the bottle. And there is still another 30 minutes left of the show! Whatever the wine/Housewives connection is, I usually justify that they’re all drinking wine, are older than me (not Gretch & Alexis) and all look darn good. If they can do it, so can I, right?? No wrong. Please. Let’s be honest here. I did promise to be candid in my intro. I on the other hand, will not be going for a fat detox body wrap at the spa for a thousand dollars. I cannot afford a nip, tuck or lift. I will not be meeting my celebrity trainer at the crack of dawn, or whatever it is they do to continue looking fabulous. I will be left with the jiggly thighs and triceps on Saturday morning (not to mention my pounding head.) The same cannot be said for Vic, Tamra, Gretch, Alexis and the new chick who married a plastic surgeon but is, “98% real.” ( Heather! That’s the new chick.) These gals on the other hand will be just as fit and fab on Saturday morning. I told you to stop watching those damn women! I will wean myself off the Vancouver housewives, but not my OC ladies.